How big is Pendleton Ward's instant cult classic cartoon Adventure Time? 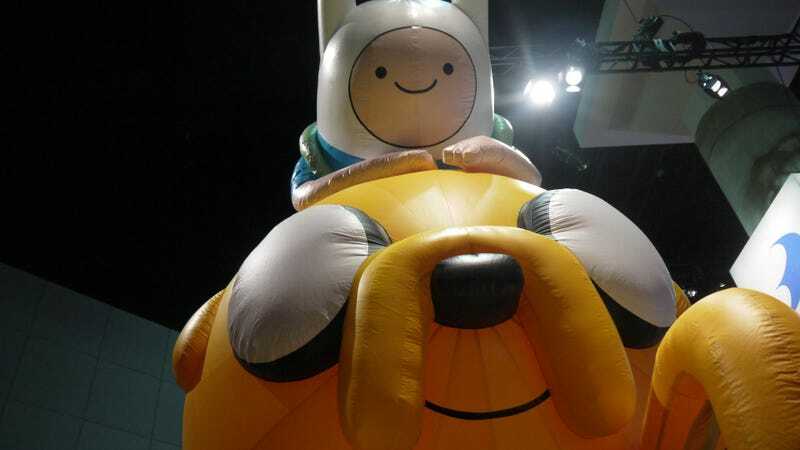 So big that D3Publishers has a giant inflatable Finn and Jake hovering over their E3 2012 booth — and the game isn't even here. And you know what? I don't particularly care that <Adventure Time: Hey Ice King! Why'd you steal our garbage?! from WayForward Technologies isn't here in playable (or non-playable) form. It's just so lovely to run into Jake and Finn in the far reaches of the L.A. Convention Center's South Hall that it just doesn't matter. D3Publisher declined my offer to climb atop the massive inflatable and ride it around the convention.